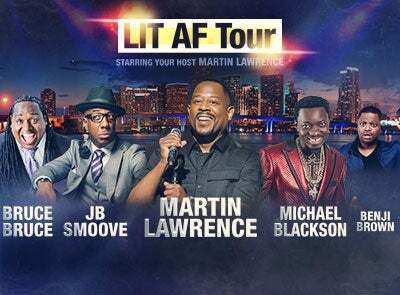 Miami, Feb. 12 - Comedian, actor, director and producer Martin Lawrence will return to the stage as the host of 2018's hottest comedy event: the LIT AF Tour, featuring an amazing lineup of comedic talent. Coming off the 20th anniversary of Def Comedy Jam, where he is known for his legendary hosting, Lawrence has made a triumphant return to the stand-up stage wowing audiences with his signature style of hilarious stories, social commentary and more. The LIT AF Tour stars Lawrence as your high-powered host who presents a fire lineup of comedians including DeRay Davis, JB Smoove, Rickey Smiley, Michael Blackson, Jay Pharoah, Deon Cole, Bruce Bruce, Adele Givens and Benji Brown. Kicking off on March 31 in Atlantic City, the LIT AF Tour will make stops in at least 16 cities across the country this Spring including engagements at Microsoft Theater in Los Angeles, Mandalay Bay Events Center in Las Vegas, Barclays Center in New York and Capital One Arena in Washington, DC. Tickets go on sale to the general public beginning Friday, February 16. American Express® Card Members can purchase tickets beginning Wednesday, February 14. The lineup and on sale date for each show can be found in the tour itinerary below. Martin Lawrence started in stand-up comedy at the legendary The Improv, where he honed his talents until he was asked by Russell Simmons to host his groundbreaking comedy series Def Comedy Jam on HBO. From there, Lawrence became a household name after his hugely popular self-titled TV show, Martin, was an instant hit with TV viewers. He starred for five years as not only the title character, but other support characters like the sassy Sheneneh and Mama Payne, who became comedy classics. Lawrence would later go on to star in comedy blockbusters like Bad Boys 1&2 A Thin Line Between Love and Hate, which he also directed and Big Momma’s House, 1, 2 & 3 where he once again proved his talent for creating and acting as multiple characters in one storyline. JB Smoove is a gifted writer, comedian and actor, who continues to entertain audiences all over the world with his unique brand of comedic funk. His breakout role on “Curb Your Enthusiasm” as Leon has firmly planted him as one of the best comedic actors today. Smoove is remembered for starring in and narrating the cult classic “PootieTang” alongside Chris Rock. Since then, on the big screen he's appeared in "Mr. Deeds" opposite Adam Sandler, “Date Night” with Steve Carell and Tina Fey, the Farrelly Brothers comedy, “Hall Pass,” “The Sitter” with Jonah Hill, “The Dictator” opposite Sacha Baron Cohen, and Chris Rock’s movie, “Top Five.” Smoove is also known for a wealth of notable TV performances including CBS comedy “The Millers," “Saturday Night Live” sketches and recurring spots on “Late Night with Conan O’ Brien,” “Everybody Hates Chris,” “The Real Husbands of Hollywood," host of NBC’s “Last Comic Standing," his Comedy Central one-hour stand-up special, “That's How I Dooz It," and Smoove is launching season three of his show “Four Courses with JB Smoove” on the MSG Network. He has been called one of the most original stand-up comics in the country, and his performances leave audiences laughing in tears. Michael Blackson, aka, ‘The African King of Comedy’, has been entertaining audiences all across the country and around the globe for more than a decade. Blackson’s comedic appeal grew from his involvement with BET’s ComicView series, HBO’s Def Comedy Jam, Showtime at Harlem, and Live in Hollywood. Along with his film and television endeavors, Blackson continues to entertain his fans as the headliner for live shows at comedy clubs, universities and special events, bringing his one-of-a kind, must-see stand-up performance to audiences all across the country and around the world. Bruce Bruce is one of the nation's favorite standup comedians. Audiences know him not only as the host of BET's Comic View, his own one hour standup specials, his Countless appearances on HBO, Showtime and Comedy Central, but also from feature films "Top Five" and "Think Like a Man," and many others. Benji Brown has been heating up the national comedy scene through his candid and comedic performances. He has appeared on BET's Comic View, Laffapalooza hosted by Academy Award Winner Jamie Foxx, and Nick Cannon's Wild n' Out on MTV, and has performed on 1st Amendment Stand Up presented by Martin Lawrence on STARZ and Tyler Perry's Meet the Browns Tour. Brown has worked alongside a list of headliners including Chris Rock, Steve Harvey, Rickey Smiley and Monique.